In true Nomadic fashion this intimate mobile tented camp moves twice a year to a new location, following the migration across the Serengeti plains, to ensure a ringside seat for Nature’s biggest show. Olakira Camp is a great value, authentic yet luxurious camp; offering expert guiding, delicious food and a warm and personalised service. 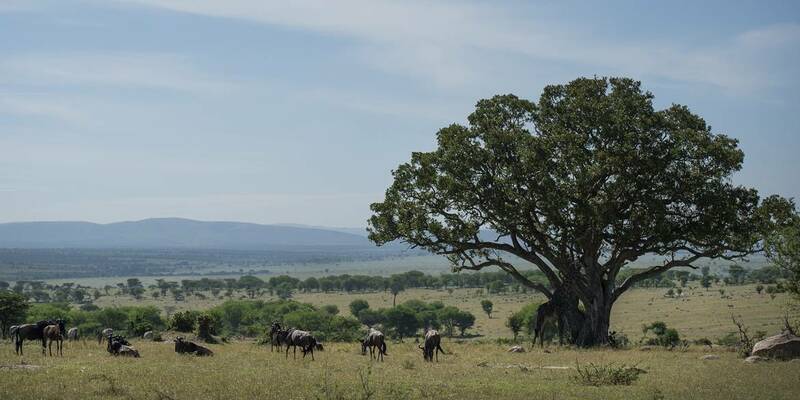 The mobile nature of Olakira Camp allows it to follow the densest concentrations of wildlife, and get closer to the vast open wilderness of the Serengeti and its breath-taking beauty. Southern Camp – Olakira Ndutu – Typically the Camp will be in the Ndutu area from mid-December to March in order to experience the magical calving season and the migration spreading over the southern Serengeti plains. The spectacle of thousands of animals giving birth to their young is fantastic to witness; this Camp allows you to remain close to the action. 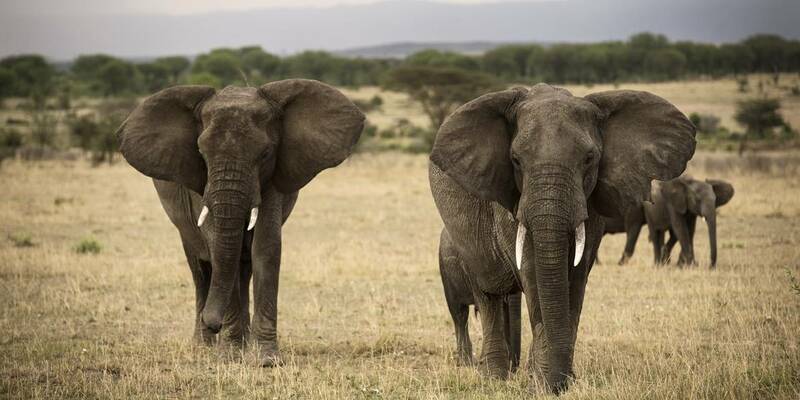 The likelihood of seeing huge amounts of game is increased due to the proximity to Lake Macek and Lake Ndutu. Northern Camp – Olakira Mara River – From June until November, the Camp shifts up north to the tranquil Bolongoja area close to the Mara River and the Lobo area. 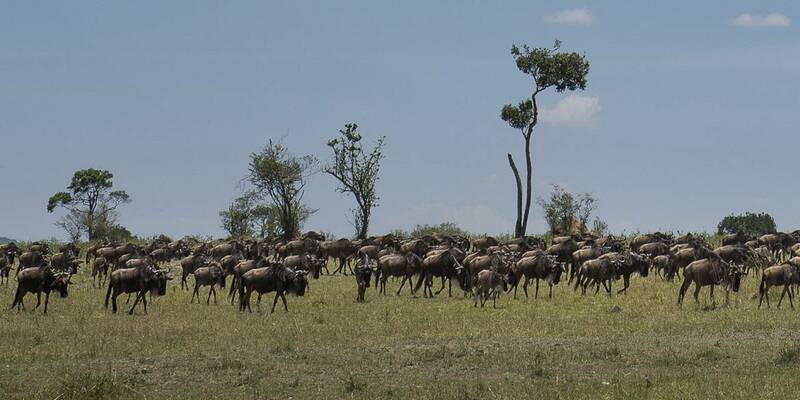 This is an optimum base to see the astonishing wildebeest migration that happens here usually between August to October. Guests can watch the migrating herds cross the treacherous crocodile-filled Mara River only 300metres from Camp. 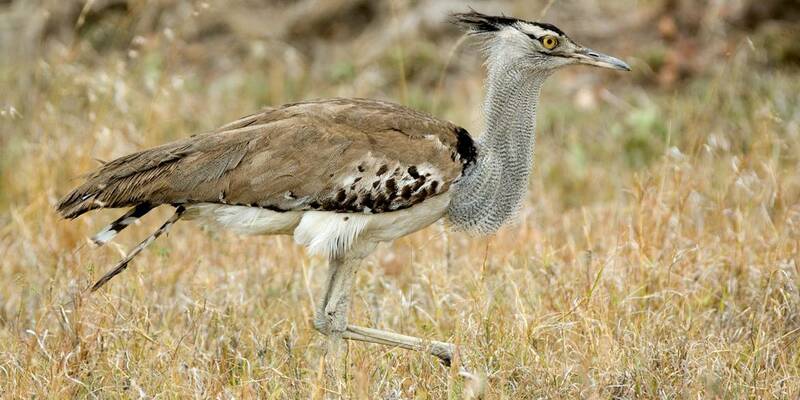 Resident game in the area is good outside the months of the migration with leopards, cheetahs and healthy populations of plains game. There have even been recent sightings of rhino in the area. 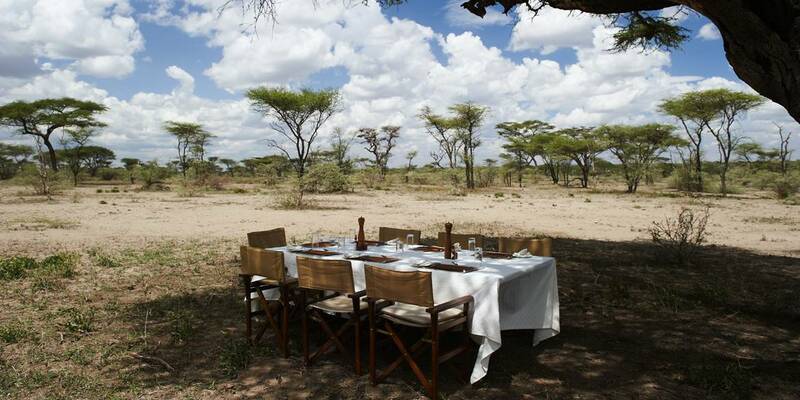 Both Olakira Camps lie within landscapes full of wildlife and have unrivalled vantage points. Vehicle based 4x4 game drives to take guests in search of Serengeti’s remarkable animals such as lion, leopard, cheetah, giraffe, elephant and sometimes rhino. Guests can explore the Serengeti with their own private driver/guide in an open-sided vehicle. Timings are flexible and you can head out for a full day with picnic or choose a morning or afternoon safari. 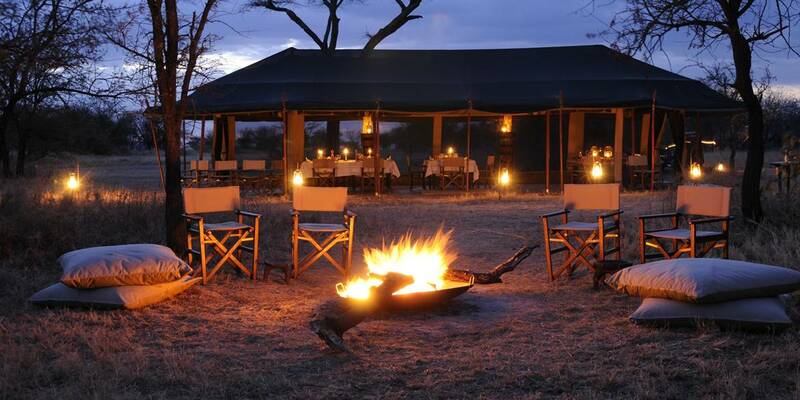 Guests have the opportunity to do a walking safari or a hot air balloon safari in the Olakira Mara River Camp. It is suitably close to the main balloon take off area which needs to be accessed well before dawn. After a long day of ‘Big 5’ and migration game viewing, head back to Olakira Camp where you can enjoy a board game, swap stories with fellow travellers or curl up with a book. In the evening, guests gather around the open fire for a pre-dinner drink and sometimes the staff band entertain the safari goers as they dine beneath the stars. All meals can be taken with your guide, which allows you to learn more about the Serengeti, Maasai culture and all things Tanzanian. Evening dinner is a combination of Western and African cuisine that uses the freshest available ingredients and paired with excellent South African wines. As with most safari camps, meals are taken in a communal dining tent but guests wishing for a more intimate dining experience can choose to dine on their own veranda or under the Serengeti stars. At night the camp looks simply magical when all the lamps are lit along the pathways threading from the dining tent to the guest tents. 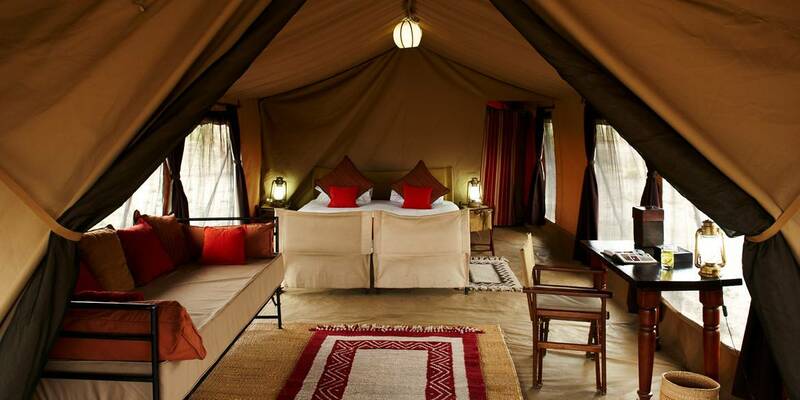 Olakira (“shining star” in Swahili) Camp consists of eight very comfortable, stylish tents. Luxurious with understated style and yet remaining very practical. Inside these spacious walk-in tents, every effort has been made to make your bush experience as comfortable as can be. Twin beds are joined to form a large king-size bed, bright durries scattered on the groundsheets and colourful African pillows and bedspreads, all designed to blend into the Serengeti’s own palette. Heavy duty canvas, large gauze windows with flaps to allow the cool breezes in and insects out, which can also be closed entirely for increased privacy, all add to the authentic safari feel. All tents have a convenient bathroom, separated with canvas walls, with an eco-friendly toilet, wash basin and bucket shower. To the front of the tents are private verandas with amazing views from the canvas chaise lounge. There are no lights, only power sockets for charging batteries. Storm lanterns with eco-bulbs inside are brought to your tent at nightfall making it beautiful and atmospheric.